The battle for smartphone supremacy between Apple and Samsung is a hotly debated topic these days. Unfortunately, since Samsung does not unveil smartphone shipment figures, little is known about the state of competition between the two technology giants. However, recently revealed research data from Raymond James's research may shed some light on the situation. As the chart above shows, the Galaxy series narrowly edged the iPhone's shipments in Q3 2012, but the launch of the iPhone 5 put Apple back in the lead with 48 million shipments as compared to Samsung's 38 million. iPhone demand has been remarkably cyclical after the launch of the iPhone 4S in Q4 2012 - this seems to be an outcome of increasing market saturation in the US. 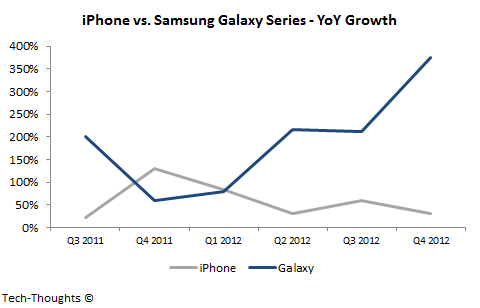 In contrast, demand growth for the Samsung Galaxy smartphones, while accelerated after the Galaxy S3 launch in Q1 2012, has remained remarkably stable. As we can see, the iPhone's growth has been slowing over the past year, something that has spooked Apple investors. On the other hand, Samsung's growth in the same timeframe has been staggering. With the incredibly hyped Galaxy S4 launch, I expect demand and growth for the Samsung Galaxy series to peak and become more cyclical over time. More importantly, these charts strongly suggest that the shipments of Samsung's Galaxy Series will overtake iPhone shipments this year, possibly as soon as Q2. Raymond James data also shows that the majority of all Samsung Galaxy shipments are driven by the flagship Galaxy S and Galaxy Note series. This, combined with the fact that Samsung owns roughly 40% of the high-end smartphone market, suggests that this change of guard is not an outcome of a "low-end strategy". Ironically, the only way for Apple to retake this lead may be through the launch of a cheaper iPhone, to spur demand in emerging markets. Beyond this year, I still expect both Apple and Samsung to come under more competitive pressure as smartphones become more commoditized. Challengers like Huawei, ZTE, Lenovo and Sony are improving their high end offerings and branding efforts which could soon help them challenge the current market leaders. T-Mobile's efforts in pushing unsubsidized smartphone plans in the US and the increasing scrutiny on Apple's European carrier contracts could accelerate this trend and help break Apple & Samsung's smartphone dominance. Is the comparison really for Galaxy series' sales and not combined sales of Galaxy S and Galaxy Note series (without S III mini)? I think that whole Galaxy series (that includes many low and mid-range offerings like Galaxy Ace, Y, Duos) sales far above iPhones sales. What I'm more interested is if Galaxy SIV will achieve higher quarterly sales than iPhone 5 did after launch (it wouldn't be fair to compare SIV Q3 sales to iPhone 5 Q3 sales). Looking at the reported data, it seems like it's mostly restricted to the Galaxy S series, Galaxy Note series and a few other high-end brands. 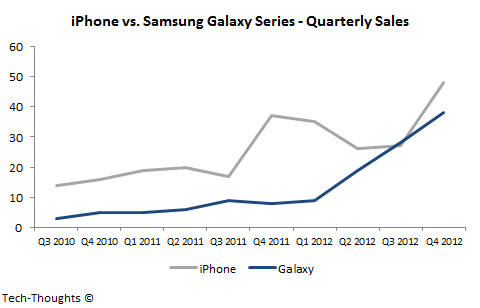 Galaxy sales haven't seemed to be as cyclical as iPhone sales, and that's what signals a mature product line. I think until we reach that point, direct comparisons will be difficult to make in any case.